Merry Christmas Decorating! My humble farmhouse is all set for the holidays and I’m ready to open my doors and share it with you. I’m joining some of my favorite bloggers today for Cozy Christmas Mantel inspiration. Their mantels are listed at the end of this post. Thanks to Krista at The Happy Housie for organizing the event! Normally I don’t decorate for Christmas in neutral tones, but I was going for a soft look and it’s just the way things worked out. 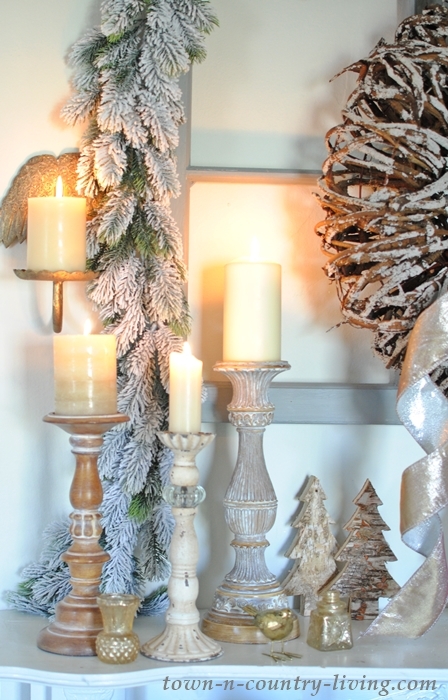 This past fall I added large candle holders to my autumn mantel and kept them in place for the holidays. My hubby calls this the “donut wreath.” I never thought of it that way until he mentioned it. A snowy garland adds a bit of frosty winter to the scene. I found it at a local boutique called Urban Grace a couple of years ago. 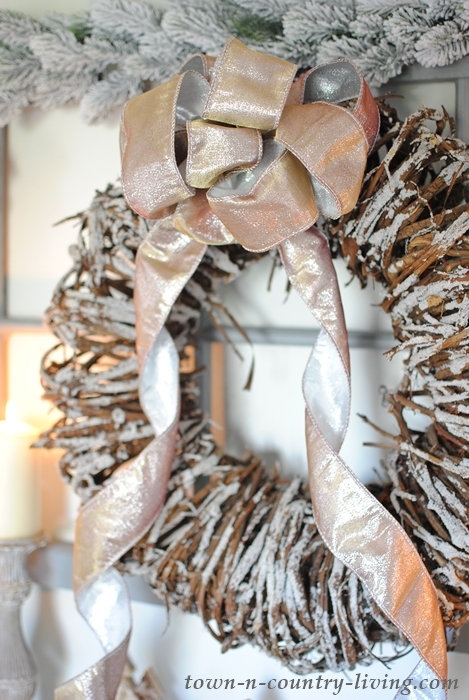 I made the bow with wired gold ribbon. I decided to let the ends of the ribbon circle down to the mantel rather than cut them short. 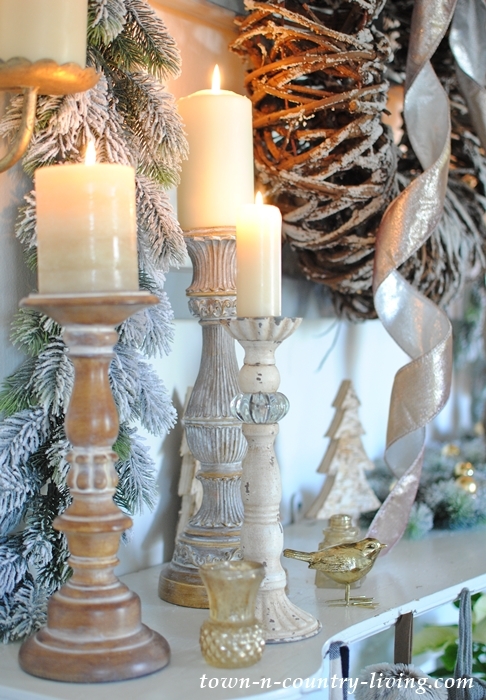 Miniature gold vases and birds add a little bit of shine with the candles on my cozy Christmas mantel. 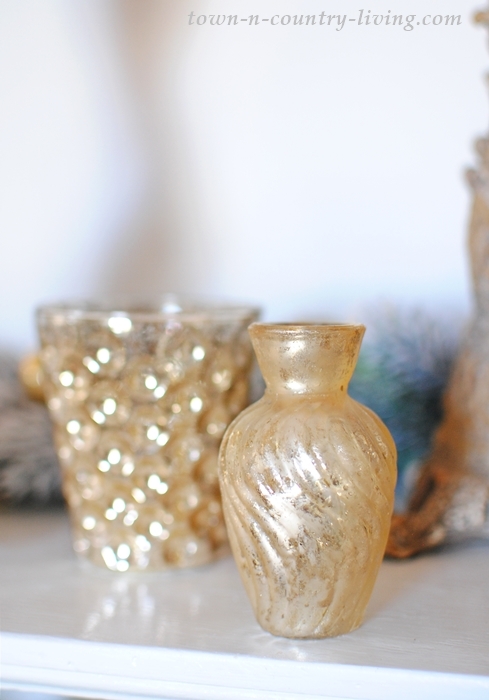 The little golden mercury glass vases are from Cocoon – my favorite store. But you can also find them online at Magnolia Market. There are six different shapes that are so cute. These little golden birds are so sweet. My grandmother used birds in her Christmas decor, too. That’s probably why I like adding birds to any vignette. A few stockings complete my cozy Christmas mantel. And I always add poinsettias to my holiday decor. My favorite color are the creamy white ones. I think they look so elegant. 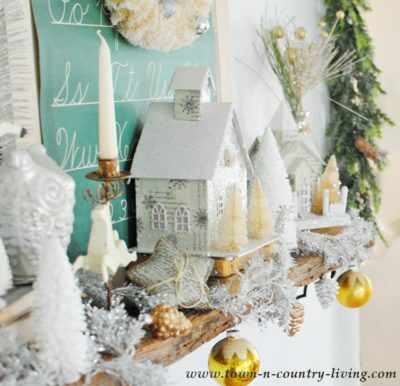 Be sure to visit my friends’ blogs and their beautiful Christmas mantels. You’ll find plenty of decorating ideas! 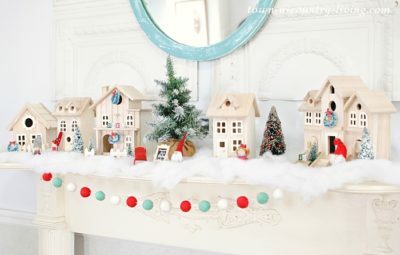 Your mantel looks lovely! I especially like the garland you used around the wreath. I use birds in all of my Christmas decorating as well. So pretty, Jennifer! I love the natural wood tones with all the white and flocking/snowy finish. Cozy, light, airy, and beautiful! Thanks for taking part in this hop! So pretty! Your mantel looks so elegant. 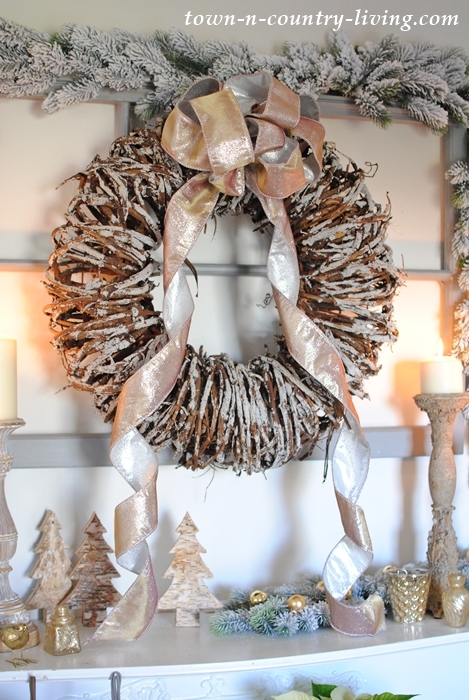 And I love the unique wreath. Looks beautiful, love that wreath. Your mantle is beautiful, I love it. It’s so cozy and draws you in to sit by the fire. I have the same little bird on my mantle he’s pictureded on my IG account. I love decorating with them. Your home is lovely!!! SO pretty as always. 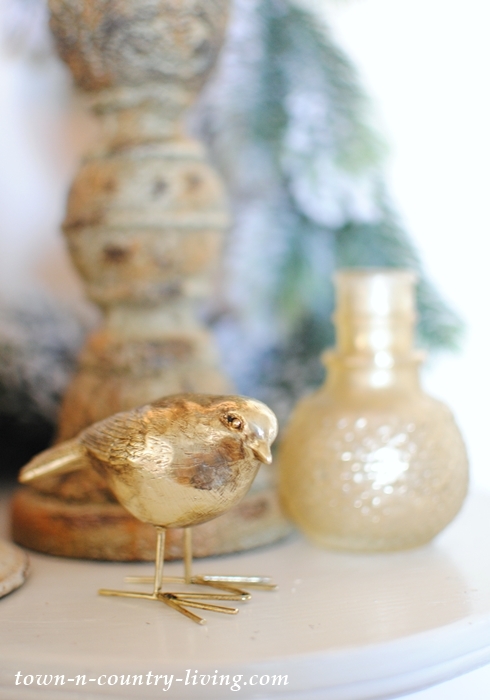 I use little mercury glass birds in my decorating too. Love those vases. I have to go check t hem out but probably gone already. 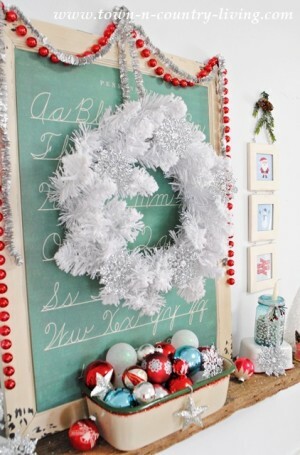 Love the bow and wreath. I love all of the neutral colors! 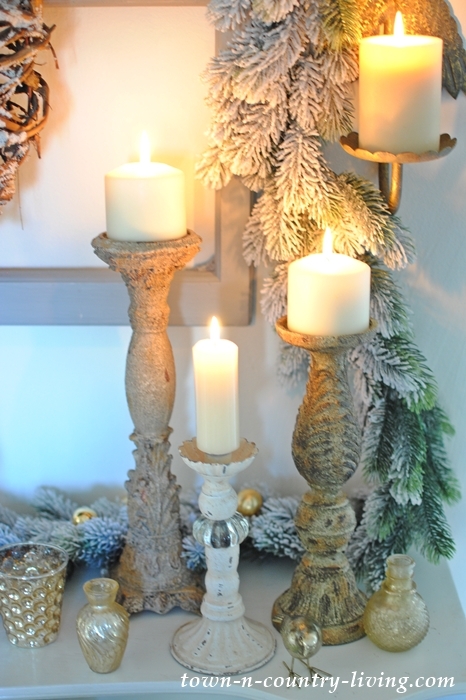 Those stockings are so cozy and love your candlesticks! 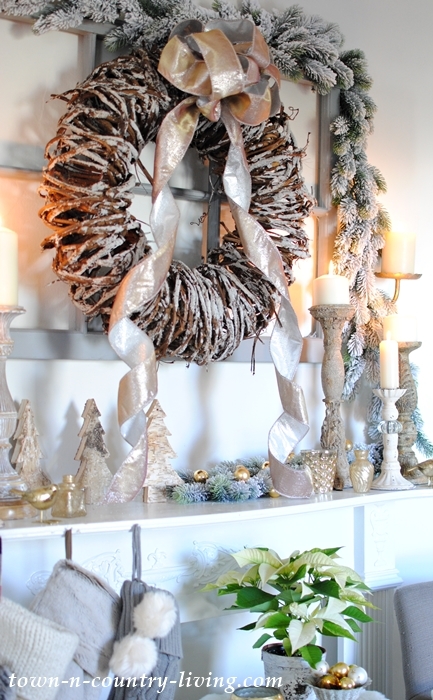 Such a pretty Christmas mantel Jennifer! 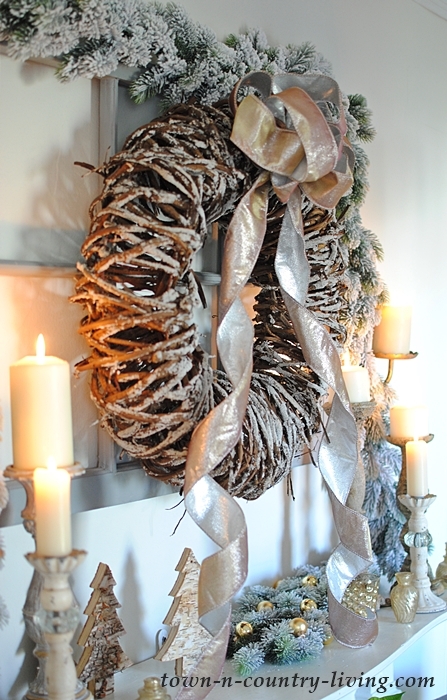 Love your wreath, garland and candles. These neutrals are really speaking to me. Just gorgeous!